Archive by Category "Service Advice"
In the interest of saving weight for better fuel economy, many automobile manufacturers have turned to plastics. The use of nylon and many other composites is common. The downside of this is in some applications, the plastic components don’t last as long. Jaguar 4.0L engines have a plastic coolant transfer housing that degrades over time, becoming brittle and eventually cracking. The original part is easy to identify because as it ages, the ends will become discolored and brittle. When this happens the coolant will leak or the radiator hose will come off the end of the housing. The thermostat housing on the 4.0L V8 is made out of a plastic composite and is subject to the same type failure as the coolant transfer housings. 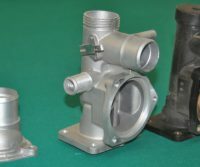 A aluminum thermostat housing that is not subject to this degradation is now available. Replacing these parts before they fail will save time, a tow bill, or even an overheated engine. Timing (cam) chain tensioners are high-failure rate components in most 4.0L Jaguar XJ8s, XK8s and S-types. The original chain tensioners consisted of a metal spring and piston with a composite body and a shoe (or “slider”) made of similar composite material. After many miles of service, the original tensioners are inclined to crack along the sides and/or lose the shoe that the chain slides along. When the plastic shoe at the end of the tensioner breaks off, it can get caught in between the chain and the camshaft gear, causing the chain to break. When the chain breaks, your engine will stop running. Furthermore, if the valves are in the wrong position when the chain breaks, they will come into contact with the piston, causing extensive damage to either the valves or the piston itself. If this happens, it is necessary to remove the cylinder head in order to replace the damaged components. The updated tensioner bodies are made completely of metal with a more robust composite shoe and are unlikely to ever fail. We can do it while you wait in under 2 hours, but we would prefer you drop it off in the morning and pick it up the same evening. Will my car run differently after the update is done? No. This just eliminates the risk of an unexpected and costly failure. How will I know if my original part fails? You will hear a loud rattling sound coming from the front of your engine. Your engine will start to run very poorly or it may quit altogether. Why does Jaguar not have a recall? It takes a lot of miles and time for the original part to fail so the factory warranty is no longer in play. Manufacturers can’t be expected to warranty vehicles indefinitely.